A successful campaign by three Celtic fans to have free sanitary products in stadium toilets has now spread to the Premier League. Brighton and Hove Albion are the first English top-flight club to adopt the ‘On The Ball’ campaign, which was founded by Scottish students Orlaith Duffy, Erin Slaven and Mikaela McKinley earlier this year. Their campaign gained its first success when the trio successfully persuaded their own club, Celtic, to stock women’s sanitary products in the ladies’ toilets at Parkhead. 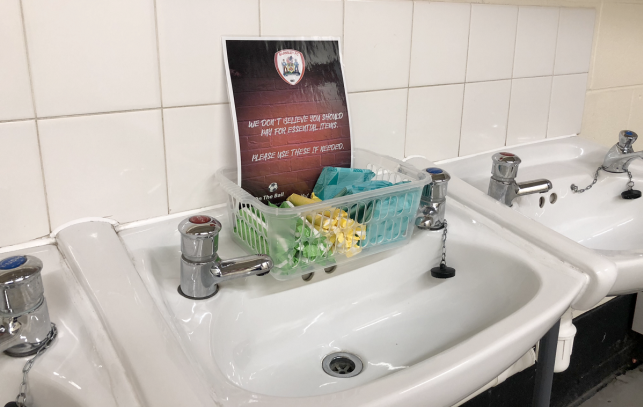 The movement spread via social media and went viral once League One side Barnsley – which is making a name for itself as a socially-conscious community club – adopted the initiative and posted a tweet of products in their own female toilets at Oakwell. Other league clubs that have now joined the campaign include Kilmarnock, Queen of the South and Tranmere Rovers, with many more expected to follow. The three On The Ball co-founders have appeared widely across the media to promote their campaign. Mikaela told the Guardian: “It’s important for football clubs to be inclusive and we hope this will encourage female fans to think they are being listened to.